The Best Portable Loading Ramp Money Can Buy! One Ramp Does it All! Wheelchairs, Motorcycles, Dirt Bikes, Scooters, Landscaping and Construction Equipment, Lawnmowers, Trench Cutters, Dollies or Hand Trucks, Bobcats, ATVs and More ! These portable ramps require less than three square feet of storage space, fold to a 9" depth and weigh in at 78 lbs. and equipped with wheels for easy transport. 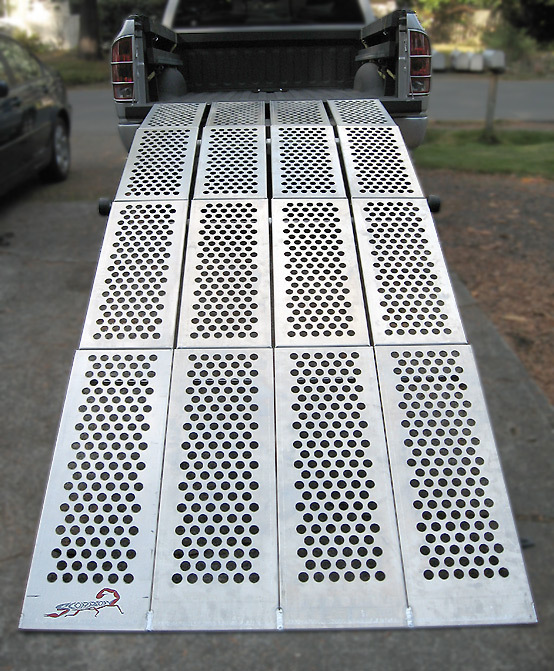 A punched and raised aluminum traction platform allows for safe use, even when wet. The ramp's patented compressed arch design allows for maximum strength and stability during use. Stainless steel hinges and machined aluminum insure a long life and unequalled durability. The design is pure genius, see for yourself. Get loaded without a hitch! Ramps come with two belt straps to secure the ramp to the loading point. No legs, hitches or parts to lose, it's all one unit. Compressed arch design allows for smooth and sturdy loading and unloading. Machined Aluminum The load is distributed on one-piece 1/8" 5052 aluminum and stainless steel, no weak points. One piece, no assembly No parts to lose. Deploy, load and stow in under five minutes your first time! Full width punched & raised aluminum traction platform for safe use even when wet. Two belt straps included for secure attachment to loading edge. The ramp doesn't go anywhere until you want it to. Machined aluminum ball bearing wheels for easy transport, so anyone can roll it. 78 lb complete unit weight weighs less than the luggage! Load, Stow and Go. 3,000 lb capacity, 1,200 lb duty rating* that's over THIRTY-EIGHT TIMES it's weight. Use it for your ATV, Snowmobile or 1500cc bike. 120" long, 36" wide at base, 34" width at loading edge* Ten foot length offers less incline than shorter ramps, three foot width allows plenty of wiggle room while offering complete end point contact to your tailgate, van, or trailer. 30 square feet of traction platform* all that tractioned space allows experts and novices alike a safe and confident loading and unloading experience in the most inclement weather. 10' long, 3' wide, folds to 9"* Needs only three square feet of storage space with 9" depth: That's your smallest closet with room to spare! . Patented multi-purpose, portable design Wheelchairs, motorcycles, dirt bikes, scooters, construction equipment, lawnmowers, trench cutters, bobcats, ATVs; one ramp does it all! 36" x 36" x 9"
Choose from 46" or 58"
46/58" x 36" x 9"
12" x 36" x 9"
60" x 36" x 9"
48" x 36" x 9"